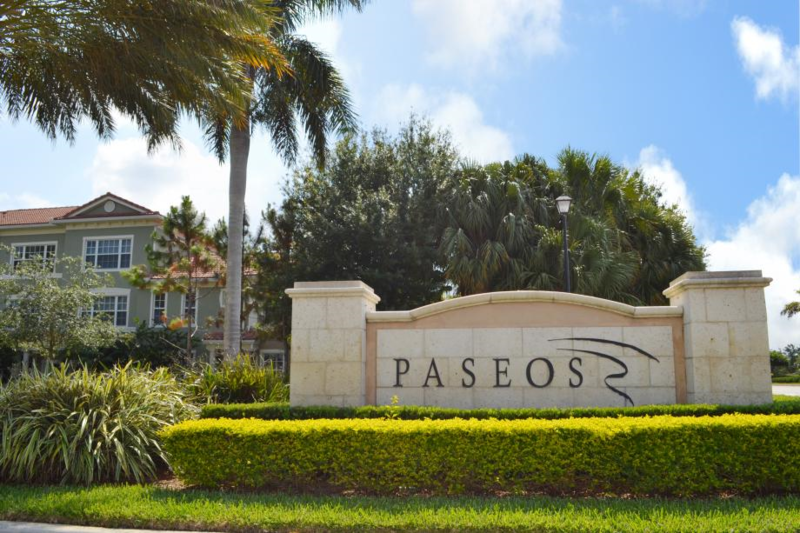 Paseos is a family friendly neighborhood located in the heart of Jupiter. The 325 single-family homes feature open floor plans and Mediterranean style architecture. Many of the homes offer 3 car garages, providing ample parking and added storage space. The sizes of these one to two story homes vary from 1600 to 3600 square feet. The entirety of Paseos is 175 acres, allowing for ample open spaces at which neighbors convene and children play. Residents also enjoy walking trails in its large nature preserve, tennis courts, a playground, tot lot and a community pool. Nearby, Downtown Abacoa is home to shopping, dining, and Roger Dean Stadium. Paseos is convenient to top notch schools, the Jupiter Community Center and of course Jupiter’s amazing beaches. 4 bedroom, 4 full baths CBS home in Paseos. Master bedroom suite and 1 additional guest bedroom on first floor. Spacious screened in private pool area. Soaring 11 foot ceilings throughout the first floor. Full set of hurricane shutters on entire house. Fenced in side yard. Solar hot water. Close to community pool and tennis courts. A+ rated Jupiter School District with plenty of shopping nearby. Best location in Paseos! Open green space directly across from the front of your house, this not only offers privacy but no headlights coming through your front window! Even better, a private backyard that isn't looking directly at another home, if you want privacy in a newer community with a 1 story floor plan this is the home. 3 bedrooms and 3 full bathrooms, open floor plan. Custom built stonework in living area off of the 5 star kitchen. Beautiful updated home. Gone in 1 day!